This focus of this audit is strictly on the event websites: how they promote and integrate social media on the website. Throughout the season we tracked each of the event’s websites during their week of play, and we rechecked our findings on September 25-26, 2014. To view last year’s audit (click here). In the last year, the number of total official channels promoted on the event websites went up from 90 to 111. They also have a concept we’re seeing more on the PGA Tour – their sponsor Hyundai will have a social media lounge setup at the 15th hole. Details are a little vague from the page profile, but we’re interested to see if any photos are posted to get a better idea of what they’re offering. See this on a lot of pro team sites, why wouldn’t you promote your channels on the site. CIMB hides their promotion of their Twitter account in the Contact Us section – should be right next to the Facebook icon in the universal navigation. (Haven’t updated their Twitter account since last year’s event – not good). Amazingly HSBC is one four events that don’t include any social media integration on their website. 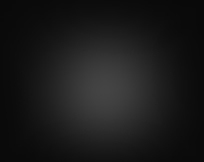 They include a feed that is somewhat hard to read due to a blue background. They added an Instagram account that was not active when the event was played on the 2014 schedule, but it won’t count on our listings for this season. 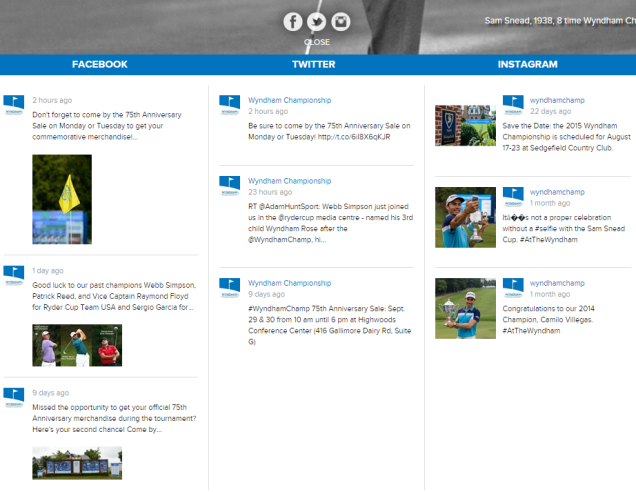 The page does promote the event’s Twitter and Facebook accounts, but overall you have to ask the same sponsor value question as the Tour Championship for Hyundai with their strategy of not having a proper event website. This post isn’t about the social strategies of the events, but I happened to see this Instagram promo the WM was running in researching their site back in February. They ran it during each round of the event. Congrats to the NT Open for removing their Pinterest channel, in last year’s review I noted it wasn’t updated properly and they have now removed promotion of it on their site and the account itself. 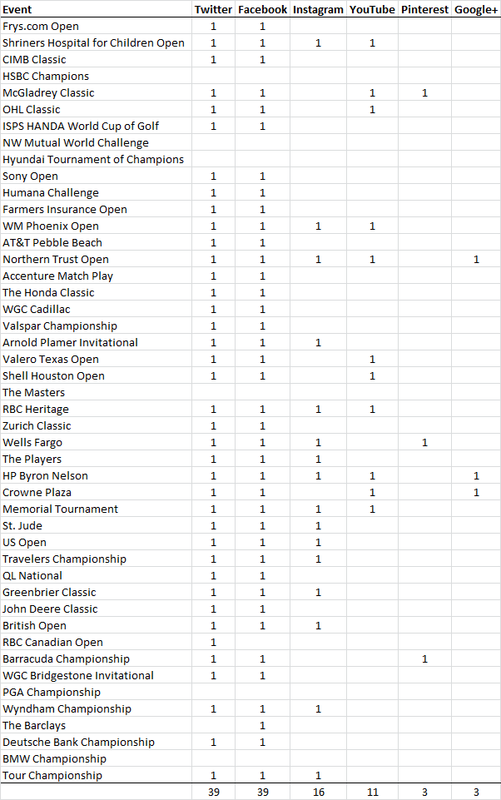 The NT Open promotes a total of five accounts (the most along with the Byron Nelson), but in reality the only have four because their YouTube link goes to the PGA account. Still the only event to link out to Facebook Photos for their photo gallery. They are one of three (Byron Nelson and Crowne Plaza) to promote Google+, but their last post was in April. 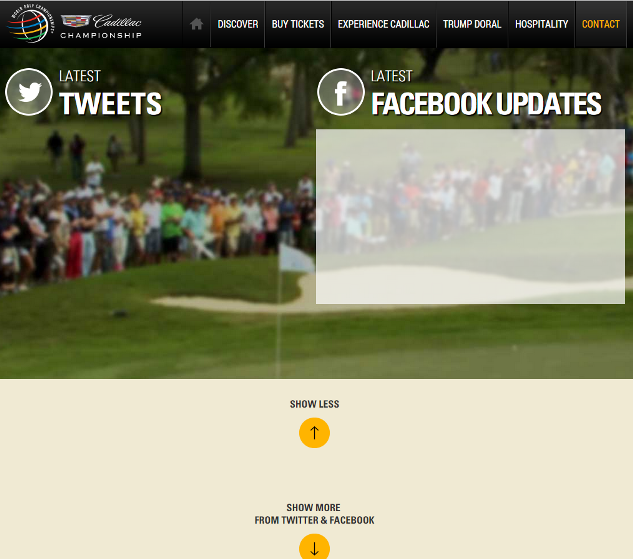 The Masters is the pinnacle golf event, but unfortunately the Masters has no social integration on their website. For more details check out this review posted from April. One of only three events promoting a Pinterest channel, but they haven’t updated it in 42 weeks. The Instagram link goes to a Facebook App page feed which doesn’t work. Facebook goes to the /HPNBC page which is still live. Instagram App Feed links to wrong account. Twitter goes to /HPBNC which is now “Make Cash”. 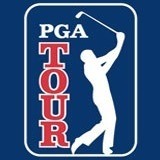 Instagram goes to /HPByronNelson which is inactive. YouTube goes to /HPBNC which hasn’t been updated in a year. G+ goes to a non-username account which does have the correct name, except for a snafu on 09.17 which still lists the page as HP. About Page also lists social incorrect links. Good lesson here about integrating the sponsor name into you social handles, if/when they leave it’s a branding nightmare. The event includes a Twitter feed module on the Home Page, but it doesn’t include timestamps for the Tweets, and in fact the feed is outdated. 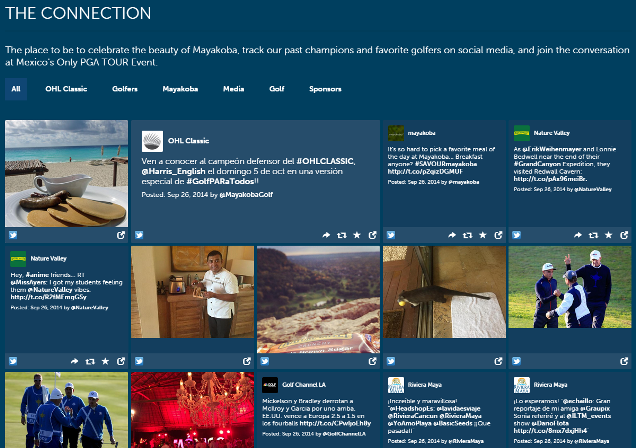 On the PGA Tour, The Memorial has set the standard for social media integration – read our 2014 review here. *Of note the YouTube universal icon link goes to a 2012 video of Tiger, when it should go to the most recent 2014 video of Jack. For details on their social efforts check out this profile we posted in June. For details on their social efforts check out this profile we posted in July. Like that the GBC includes the #GreenbrierClassic hashtag on their SM listings for Twitter and Instagram, would recommend they give it more exposure by including a full graphic footer as well. Every event that uses a consistent hashtag should do the same. They were the only two events to promote a Flickr channel last year, but both accounts were inactive. Good to see both drop promotion of the channel this year. For starters BarracudaChampionship redirects to RenoTahoeOpen.com – no way that happens if I’m in charge of sponsorship for Barracuda Networks. Next up they promote a Flickr account that has been inactive for years. The YouTube link goes to a Ren-Tahoe search listing instead of the Barracuda highlights. The Twitter link goes to a dead Reno_Tahoe_Open link. Pinterest goes to a correctly branded username, but the first board is titled: Views of Reno-Tahoe Open. Facebook did go to a properly branded username. For details on their social efforts check out this profile we posted in August. Somewhat hidden on the Home Page below the SM icons is an Open link which shows a clean feed of their Facebook, Twitter, and Instagram accounts. On the Home Page they link to the wrong Facebook account, and the Hub is a confusing puzzle feed. Also no link to their Twitter account on the site. I get that this is the Tour’s event and they want to promote their own digital solution, but the template event site provides absolutely nothing to sponsor Coca-Cola. Incredible that as savvy as Coke is at marketing that they allow this to happen – missing a huge opportunity. Nothing has really changed in the 2 years since the last event was held (read our 2012 review). 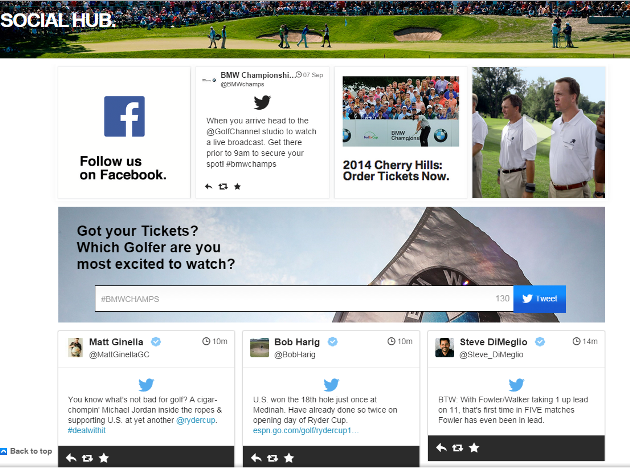 The US side dropped the 13th man activation (it’s still live though – http://www.rydercup.com/usa/13th-man), and the Euros added a Social Feed section – http://social.rydercupeurope.com/. These event sites need to be redesigned: content architecture and design.